As the story goes, upon meeting Maurice Sendak for the first time Prof. Yosef Hayim Yerushalmi asked him, ” When you were a boy did your mother call you a Vilde Chaye?” Sendak turned white as if Yerushalmi had some how spoken with his deceased mother. Sendak asked ” How did you know?” Yerushalmi responded,” You wrote the book on it, no? Where the Wild Things Are“. Today we mourn the loss of Maurice Sendak. 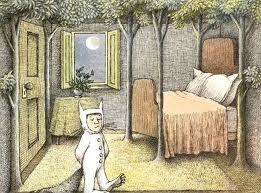 For many of us Sendak was our first favorite author. He helped frame our childhood in all of its colorful moods. His work is timeless and simple, but not simplistic. Where the Wild Things Are was not just the story of my childhood or your childhood, but also the story of our people. Jewish history has been an exercise in exile and return. As of late we seemed to have done well in Diaspora, but still in the end we miss our home and long to return. The Jewish State is the realization of years of longing. Israel our national homeland for all of the Vilde Chaye. Yerushalmi uncovered the importance of Jewish memory. As a parent raising Jewish children the lessons of Sendak and Yerushalmi are one and the same. When my child grow up I want them to contribute to society without forgetting about our past. I want them to be at home ensconced by the books of the library and the Beit Midrash. Books are the ships that can set our imagination free to sail in and out of time to explore everything. But reading and learning about the world is not enough. In this wisdom they need to realize their connection and obligation to make the world a better place. And while they might act out ( and yes I do expect each of them to be coronated as royalty of the Wild Things), I want my children to know that their soup will always be warm and ready for them whenever they come home.